Looks like this icon has been around for a while now, but I just discovered it. 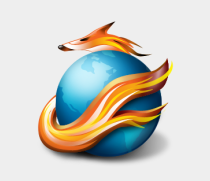 I preferred when Firefox was called Firebird, mostly because of Jairo Boudewyn's awesome Crystal Ball icons (and because it went better with Thunderbird and Sunbird). But it looks like Firefox has a decent OSX dock-type icon now. Still not as good as the crystal ones, but plenty good in its own right.